The seasonings are just the right to compliment the natural taste of turkey. 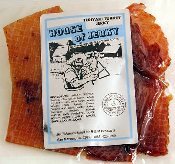 For those who are health conscious or just appreciate the unique recipe we have developed over the years to make the best Turkey Jerky in any house - Guaranteed! We only use fresh free range hormone free turkey breast.